Citation Information: J Clin Invest. 2004;113(8):1112-1114. https://doi.org/10.1172/JCI21450. Lipogenesis is regulated by sterols and by insulin through the regulated expression and activation of the sterol regulatory element–binding proteins (SREBPs). A new study shows one way in which sterol and insulin regulation can be decoupled. In transgenic mice overexpressing a protein that regulates SREBP activation, lipogenesis is more sensitive to cholesterol and less sensitive to insulin. Integration of metabolic signals at the ER membrane. (A) During fasting, expression of the SREBP-1c precursor (pSREBP-1c) is reduced. Insig-2a is expressed and binds to SCAP, causing retention of a very low amount of pSREBP-1c in the ER in the presence of sterols. (B) Upon refeeding, insulin increases the expression of pSREBP-1c and decreases the expression of Insig-2a. The low abundance of both Insig-1 and Insig-2a leads to greatly increased processing of pSREBP-1c to mature SREBP-1c (mSREBP-1c), leading to a lipogenesis rate that is more than tenfold higher than that of the basal state, which represents an “overshoot.” The increased level of mSREBP-1c promotes expression of Insig-1. At a critical stoichiometry relative to SCAP, Insig-1 restores sterol-mediated regulation of pSREBP-1c processing. The lipogenesis rate then returns to the original basal level. (C) With transgenic overexpression of Insig-1, the cycling of lipogenesis between the fed and fasted states is dampened. The high ratio of Insig-1 to SCAP causes retention of pSREBP-1c in the ER. Fasted mice have a modest additional drop in lipogenesis due to the reduction of pSREBP-1c expression and increased Insig-2a levels. (D) With refeeding, the transgenic mice express extremely low levels of pSREBP-1c due to their inability to produce enough mSREBP-1c to drive the transcription of the pSREBP-1c gene. 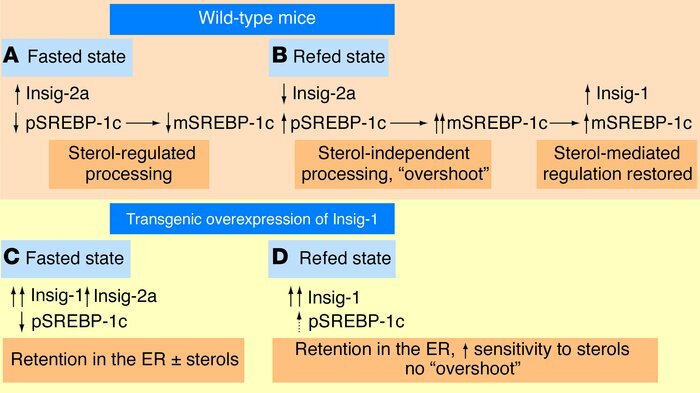 The persistently elevated level of Insig-1 abolishes the dramatic “overshoot” in lipogenesis seen in the wild-type refed mice but still mediates an enhanced sensitivity of pSREBP-1c processing to sterols.